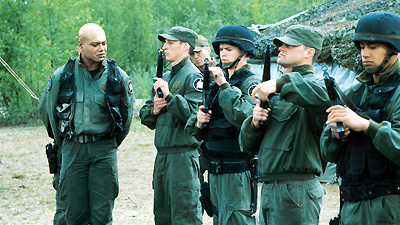 SG-1 comes upon a battle, and provides assistance against an army of Jaffa, but they are overwhelmed. They awaken later to learn that they have arrived at a training camp and that the soldiers are following standing orders from Apophis to engage in war games in preparation for an invasion of Earth. O'Neill explains that Apophis is dead, but the young soldiers refuse to believe him. Only when the camp's leader, Captain Rogers, is wounded and returned to Earth for treatment, is he convinced of Apophis' death, and disbands the war games for a battle that will not come. Goa'uld often use humans as fodder in battle. The young soldiers were brought through the stargate from different worlds five cycles ago, shortly after SG-1 destroyed Apophis' ships. They were trained by Jaffa masters and learned about Earth from SG-11 who were captured by Apophis and declared MIA eight months ago on P89-534, but who revealed little about Earth before they died. They were left with standing orders to practice the exercises of battle according to the Rules of Engagement until the return of Apophis, in preparation to infiltrate the Tauri as SGC units. The Rules of Engagement are the code of battle during a young Jaffa's training, as dictated by Apophis. The Final Challenge is the day in a warrior's training when first blood is shed, and the games become real. Captain Kyle Rogers (real name Rophiapgisy) is acting Quadrant A Commander. His second in command, Captain Nelson (No'var) heads the Jaffa forces. In'tars are weapons used in training. They can take the form of any weapon, use a crystal power source, and are only meant to stun. The vo'cume is a device that projects a recorded audio/video image, used as a symbol of authority.